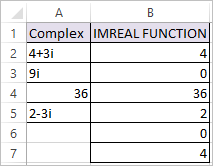 IMREAL Function in Excel returns the real coefficient of a complex number. Real coefficient of complex number is the coefficient of real value.The real coefficient of the complex number, z = x + iy is x. Where inumber argument is a Complex Number. In row number 6 IMREAL Function takes up complex number(imaginary component) as a value which should be enclosed in double quotes. It returns 0 because there is no real component. In row number 7 IMREAL Function takes up real component as a value which returns 4.